Leaving Georgia, we head towards my cousins’ home in the hills of Tennessee. 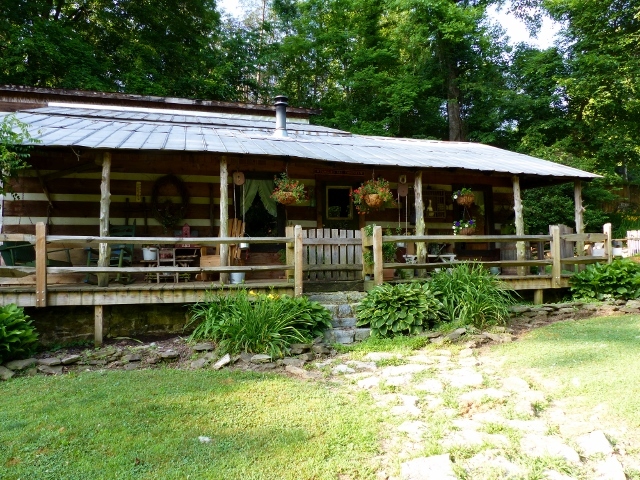 This is the log cabin experience, the full Eco-lodge facility. Feeding the goats and chickens happens twice a day, my cousins grow their own food, make their own cheeses and live in this idyllic up woods hideaway, close to grandchildren and not too close to town. 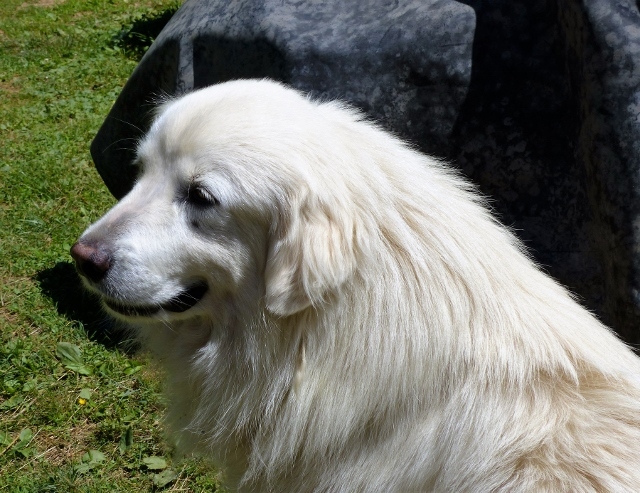 They don’t have a house alarm, but they do have a Great Pyrenees, to keep foxes, snakes and strangers away from the goats and chickens. This dog is the size of a bear. He takes his job as guardian to the family and animals very seriously. Once he gets to know you, he doesn’t bite, or so they promised us. 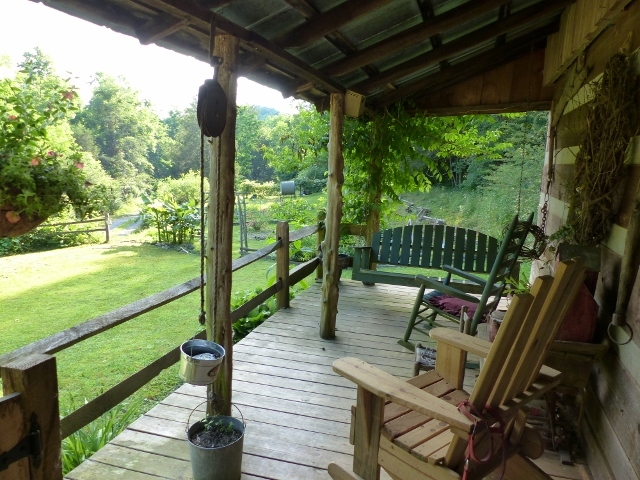 We had several highlights to this portion of our journey, sitting on the porch and listening to the goats bleat, was almost a zen moment. You really relax here and enjoy the conversation. Discussions of politics are not allowed, so we were all calm and happy. A rocker and a swing a great place to watch the sun go down. We did go down the mountain and visit civilization because there was the excitement of a vintage car show. 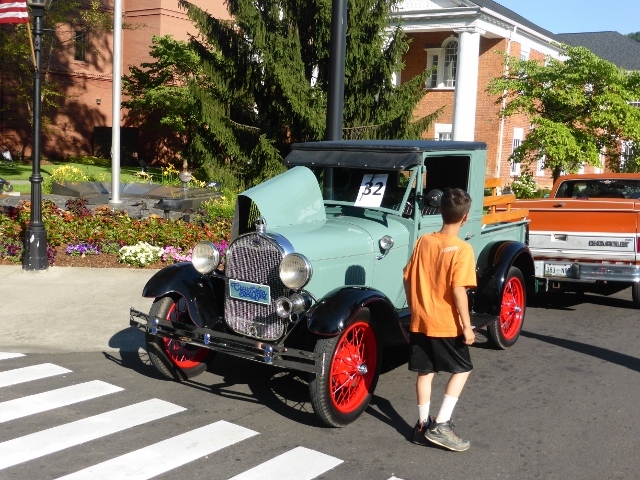 I could almost do a full blog on these gorgeous old cars that lined the streets in the center of town. 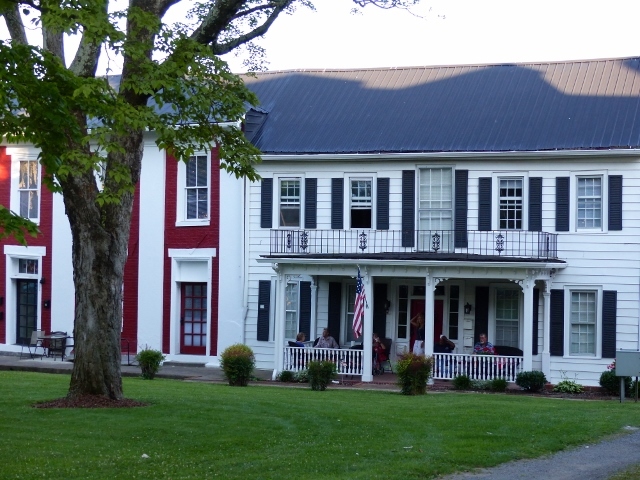 It was great to stroll around the historic district and seeing beautiful old mansions, just a few hundred years old and still stately. Everyone would agree that the most fun we had been the watermelon eating contest. Several young men ate a tenth of their weight in watermelon. Watermelon seeds were somehow distributed all over the yard and the boys. Getting together with cousins was a highlight of my childhood. Seeing all these cousins play brings back memories of making ice cream, eating watermelon and running outdoors in the yard with the dog. Even though we aren’t sailing in the Med, we are enjoying azure skies and the beautiful country of the US. We are in my Mother’s home state of Georgia, my ancestors were here when Georgia was still a colony, so the connection runs very deep. Ten minutes from landing at the Atlanta airport, my Southern accent is returning. When we were young and going to visit our grandparents, we would practice our Southern accents on the way down south. 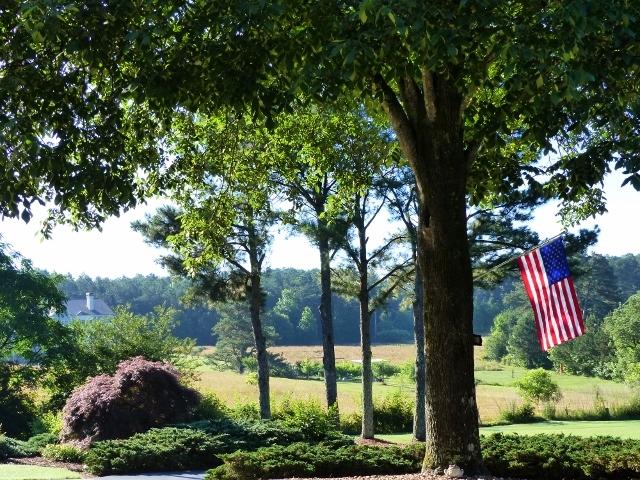 We are off to visit cousins, Don and Becky at their gorgeous home just minutes from Atlanta. 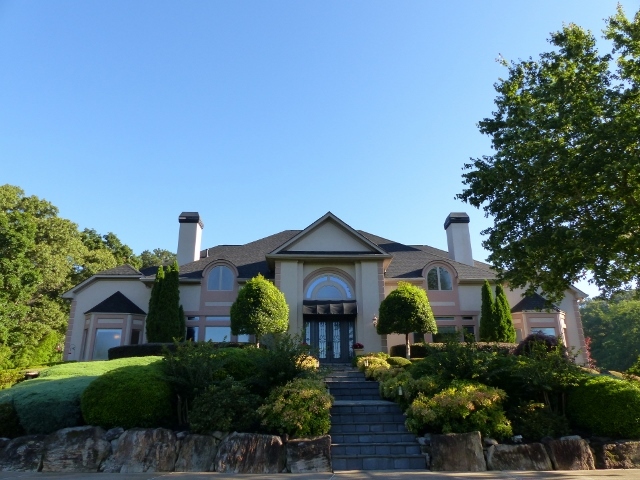 Hey you Sydney-siders, would you like to see what $1 million buys you in Atlanta, GA? As elegant as the house is, it is the 4.87 acres of gardens and tennis court that captured my attention and my heart. Turns out my cousin Don is a great landscaper and gardener, spending time on every aspect of this very special garden. This is what Georgia looks like. 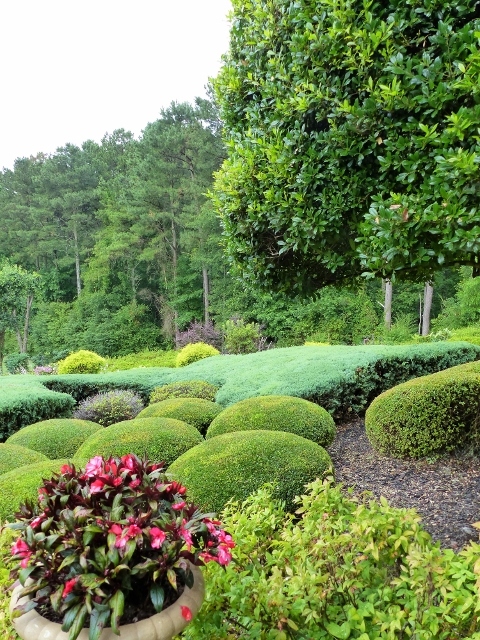 The garden remind me of Japanese gardens, but with the pine and hardwood forest as a backdrop instead of rice fields. We are in the country but within easy reach of Buckhead and Atlanta and we made the most of the shops in Buckhead and Peachtree City. You don’t see or hear neighbours, but we did hear their rooster some mornings. We love our neighbours but this garden is serene. The hospitality is wonderful in the South and we were spoiled with cousins Jerry and Marilyn coming and visiting us, Tanya having us down to her gracious home in Warner Robins and Judy and Butch making us lunch in Rome. 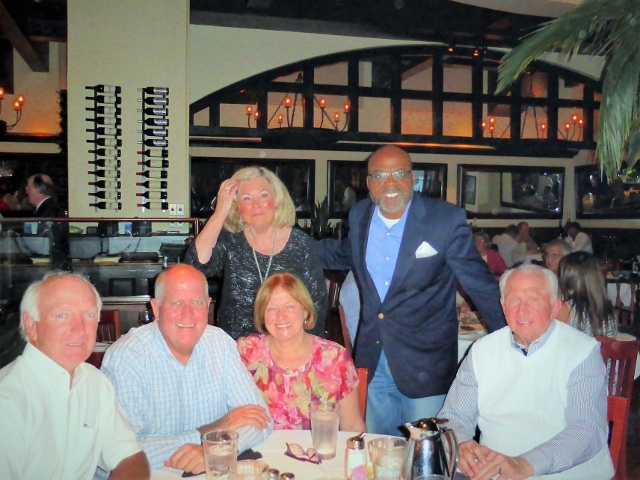 We went to a fabulous restaurant in Atlanta near Buckhead, New York Prime, to hear the wonderful impressionist, Maxwell Taylor reprise all the great male singers of the 20th Century. What a splendid evening. Thanks Georgia for all the hospitality. It is so wonderful to visit and connect with that Georgia red clay.